Rosie Huntington-Whiteley attended Moet & Chandon Etoile award ceremony to honor Mario Testino for his contribution to cultural society at Park Lane Hotel in London, England. English babe stepped out in a beautiful white dress and looked smokin’ hot at event. Q: Hi, Is it possible to see the dress in burgundy, red and dark green? Also, would you be able to lessen the plunge in the front either my closing it a bit or putting some chiffon mesh across the front? Thank you. A: Dear Nisha, Sorry we don't have the pictures of the dress in burgundy,red and dark green color.We just sent the color chart to your email.Please check it.Yes we can lessen the the plunge in the front.Please also add the request of this in your order comment.Thank you for contacting us! Q: Is it possible to see it on the web site in a different color? I wanted to see it in Navy and Burgundy? A: Dear jackie, We have send the pictures to your email.Please check them.Thank you for contacting us! Q: can you add a train to this? and is the bottom the same material as the top? A: Dear Shakila, Yes, we can add a train for you. How long do you want for the train? Please include your request in your order comment. You will be able to leave comment at the last step checking out before making payment. You can also email us or contact us by live chat after your order is placed. Yes, the top and skirt are out of the same fabric. If you have any other concerns, please feel free to contact us. Q: Hi, if I order this dress on the 19th of october will it arrive before the 6th of november if I rush order it to Sydney Australia? A: Dear kea, This dress is made to order. Currently(October) new orders will arrive about two to three weeks. We can put priority on your order. If you order within 24 hours, the time is OK. Please include your request in your order comment. You will be able to leave comment at the last step checking out before making payment. You can also email us or contact us by live chat after your order is placed. Please order asap. Thanks for contacting us. Q: I'm from Puerto Rico. If I order this today when will it arrive? My prom is on May 10..
A: Dear Summer, This dress is made to order. Currently(April) new orders will arrive about three to four weeks. We can put priority on your order. If you order now, the time is OK. Please include your request in your order comment. You will be able to leave comment at the last step checking out before making payment. You can also email us or contact us by live chat after your order is placed. Thanks for contacting us. 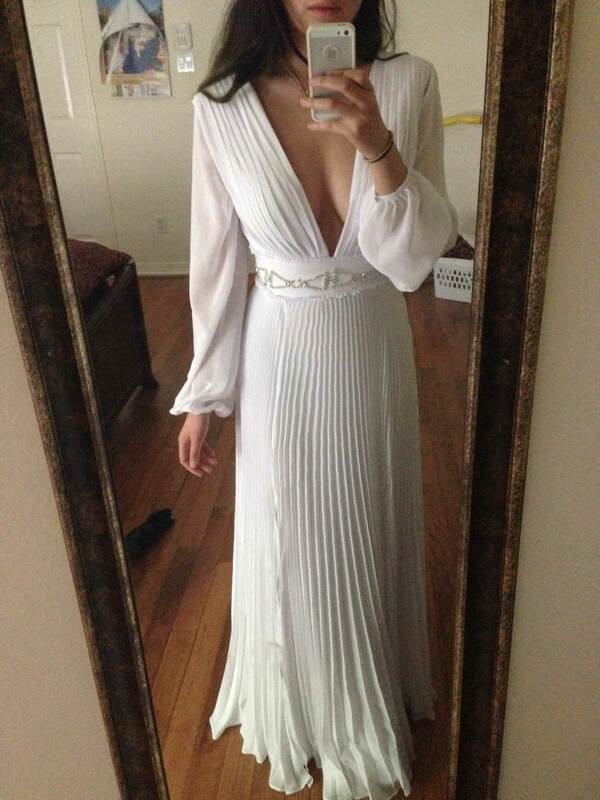 Q: Selling this dress in a size four, email me at jhammer716@gmail.com if interested! Q: Can the back of the dress be closed all the way up? A: Dear Maria, Yes, we can do that fr you. But please understand that such changes would be considered as a custom made which is not returnable. If it is OK with you, Please include your request in your order comment. You will be able to leave comment at the last step checking out before making payment. You can also email us or contact us by live chat after your order is placed to double check. Thanks for contacting us. Q: Is it possible to close up the front v-live a bit at the bottom? A: Dear Sharon, Yes, we can do that for you. Please include your request in your order comment. You will be able to leave comment at the last step checking out before making payment. You can also email us or contact us by live chat after your order is placed. Thanks for contacting us. Q: If I Order This Dress Today 4/6/14 With Custom Measurements Is it Possible to Have It By May 3 or 4th? Is The A Rush Option? A: Dear Eunique, This dress is made to order. Currently(April) new orders will arrive about three to four weeks. We can put priority on your order. If you order within 24 hours, the time is OK. Please include your request in your order comment. You will be able to leave comment at the last step checking out before making payment. You can also email us or contact us by live chat after your order is placed. Thanks for contacting us. Q: would you be able to make it to only 1 slit down the leg? A: Dear Keshavi, Yes, we can do that for you. Which side do you prefer? Please include your request in your order comment. You will be able to leave comment at the last step checking out before making payment. You can also email us or contact us by live chat after your order is placed. Thanks for contacting us. When I got this in the mail, I thought it was the most hideous dress my eyes had ever witnessed. I ordered it on February 25th, with custom measurements and received it a month later on March 25th, which made me extremely anxious to receive it. 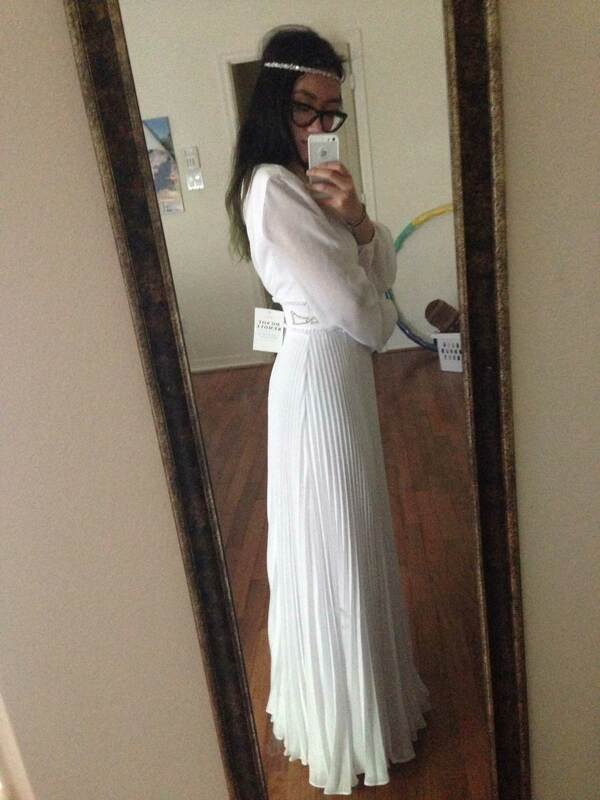 My prom is on April 24th, and I think it's weirdly fitted. 1) The waist is really high, maybe I measured it wrong, but it ranged about 2 inches higher than my waist. 3) The sleeves are WAYYY too big, make sure you request them to be tighter because mine are the size of floaties and it looks strange to me. 4) If you want the same slits, make sure you also request the slits to be mid thigh, not knee high. Overall the dress is okay, all my friends approve of it, but I honestly hate the way it looks on me.